Soul Caffeine - Guest Post - Soul Caffeine Brownies! Guest Post - Soul Caffeine Brownies! Hey y’all, I’m Whitney & I’m so excited to be able to guest post for the Soul Caffeine crew! Mallory was generous enough to let me ‘borrow’ some coffee beans if I concocted a super delish recipe with them, and I think I held my part of the deal -- I just need a delivery service from Gulf Shores to Daphne to deliver them a batch! Don’t worry I’ll get you some ASAP! I decided I’d make something sweet with the Brazilian coffee Mallory let me use. Since her description said “Smooth body, even acidity, with notes of almonds and chocolate,” I thought it would be perfect to make some brownies! The first time I heard of adding coffee to brownies was from cookbook called “Alabama Back Road Restaurant Recipes.” The recipe was from a restaurant called Cabbage Bowl Restaurant in Henagar, Alabama for their Texas Brownies. The coffee adds a subtle richness that it otherwise wouldn’t have.. And it’s especially good when you have the best coffee in the biz! Now the flavor of the coffee is super subtle, but I’m sure the more you add or the stronger the brew, the more noticeable it will be. With my measurements, even non-coffee lovers approve! -- My brother is one of the pickiest kids in the world and loved these. When I get a thumbs up from him, I know they’re good! I decided to spruce up the brownies with a cream cheese & Amaretto icing for the topping to make them super indulgent. Amaretto is one of my favorite liqueurs. In fact, my mom would always request me to make an amaretto sour for her when I would come home to visit from college. In the first batch, I tried to swirl some red food coloring in the some of icing, but then I realize I’m definitely not a cake-decorator and should leave the swirling to the experts! You can also top the brownies with some sliced toasted almonds, but these are completely optional! You can easily substitute the almonds with your choice of nuts. I’m sure peanuts, walnuts, pecans or [toasted] coconut would be other good toppings. And seriously toasting whatever nut you use makes a world of difference -- just add them to a pan over medium - medium-high heat for about 5 minutes. Stir every few minutes, and when they start to smell toasty, you’re done! Next time you’re wanting to make an impressive dessert for some friends or co-workers (or for yourself, I don’t judge), remember this coffee brownie recipe! Soul Caffeine is now selling their beans for brewing, but really you can use any brewed coffee to add that special touch. For the brownies, preheat oven to 325ºF. Coat 2 8x8 pans with cooking spray, then line with parchment paper. In a large bowl, sift together flour, cocoa powder, baking powder and salt. In a larger bow or stand mixer, cream melted butter and white and brown sugars. Add eggs, coffee and vanilla, and whisk until smooth. Slowly add dry ingredients to wet ingredients, and beat until combined. Pour and smooth into prepared pans and bake for 40-45 minutes. Remove from oven and let cool completely before frosting. Beat together cream cheese, butter and Amaretto. Add in powdered sugar. Separate about ¼ cup from the icing and stir in with food coloring. 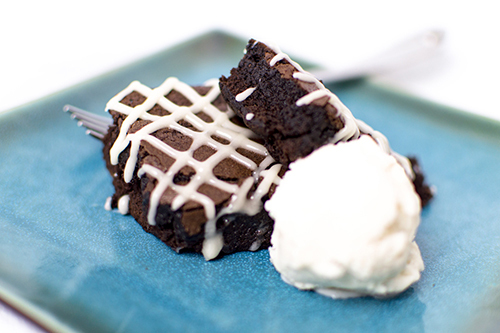 Spread white icing over brownies, then drop on spots of the red and swirl with a toothpick. Top with toasted nuts.